It is at this point that I begin to sound a little strident but you will have to excuse me because the insult and injury to me in this conclusion of Part III is extremely personal. Again, I noticed a number of my foodblogger friends coming here and probably getting a bit of a shock at the seemingly endless dance-related posts. My apologies, me hungry friends, but I made a promise to some dance peers that I will give a detailed review of an event which happened recently and until I fulfill that, regular gluttonous posts will not resume. However, I can promise that they will resume soon with a review on a vegetarian restaurant, Iranian cuisine, modern Italian cuisine and maybe if things work out, another recipe. Till then, please bear with the dance posts. The brave little dancer from Alhambra was up next. Lay Khoon was the only dancer in this competition who did not have a costume change. Which, to me, was not really an issue as her white bedleh was extremely flattering on her and was modern enough to see her through the fusion segment. Performing a pop fusion number to a remixed version of Enta Omri from the overplayed Bellylicious compilation CD, Lay Khoon again floundered with timing in her inexperience . I thought the interpretation of the music was a little feeble and the music was just too fast for Lay Khoon’s weak technical foundation. Her stoic performance earned her a 5.5/10 for presentation & framing; 4/10 for fluidity of technique; 4/10 for expression; 4.5/10 for originality & creativity; and 4/10 for rhythm & musicality. Overall, she scored a 4.4/10. I was not keen on Sha Sha’s entrance into her fusion number. Shrouded in her blue and yellow double veils, she looked like a mourning wraith creeping sideways into the stage. While this was meant to lend a dramatic touch to her entrance, it just came across as funeral and creepy. Sneaky little …er, big … Sha Sha immediately appealed to my mushy, lyrical-loving side by performing a subtle, softly delicate piece to Towers of Dreams. While Sha Sha had not blown me completely away during her Traditional performance, she was much more appealing in her Fusion interpretation. Her musicality and stage persona were more apparent and I liked her control of her double veils, which enveloped her in an ethereal cloud without swathing her from sight. It was then I really envied her height as the visual impact of her barrel turns with the double veils at such height was quite stunning. Just as I was getting a little visually jaded, Sha Sha literally pulled out her next surprise. Whereas we assumed she was just doing a pop fusion, double veil routine, it turned out Sha Sha was actually performing a Chinese fusion dance. Tucked into her hip belt were two Chinese dance ribbons which she proceeded to unleash into twirling ribbons above and around her. The surprise element was worth ½ point at least and I applauded her creativity until someone informed me later that the choreography appeared to be a Tamallyn Dallal’s number. Sigh. I had to reassess the points I gave her for originality & creativity. While it was a beautifully performed number and Sha Sha should be commended on her understatedly elegant performance, the lack of attribution is a sore point with me. Technically, Sha Sha was competent in her middle eastern technique but to be honest, her Chinese ribbon technique was basic, albeit well controlled and visually captivating. Also, because so much attention was paid to her props, except for her opening sequence, there was not much middle eastern dance integration. I would have liked to see a better balance. For her performance, I gave Sha Sha a 7/10 for presentation & framing; 5.75/10 for fluidity of technique; 6/10 for expression; 3.5/10 for originality & creativity; and 6.5/10 for rhythm & musicality. Overall, she garnered a 5.75/10. I have to take a deep breath at this point because the next dancer offended every inch of my body, mind, soul and spirit. The next dancer was Jenna. From her attire of gold lame harem pants and choli, it was obvious her item would be an Indian fusion piece. Before this competition, a few dancers had joked that it was likely that some of the organiser’s students would rip off at least one of my Indian fusion choreographies. I had retorted hopefully that they were surely not be so disrespectful or delusional and would seek my consent or at least inform me if they were. As far as I knew, none of her students were up to par to perform any of my numbers without some serious coaching. When Jenna came out, 3A again nudged me as if to hint that it was probably one of my numbers. When I saw Jenna holding tealights, I wondered but thought it could not be as I had not taught that lot how to dance with tealights to any of my numbers. When Jenna laid on the ground and placed the tealights on her body and hands, I cringed at her corpse-like and totally inappropriate pose and told 3A in relief that it was not one of mine. When the first strains of Nusrat Fateh Ali Khan’s dulcet vocals wailed across the room, I sat there gobsmacked. Not only did she lift my choreography, she was massacring it right before my eyes. She and her schoolmates had seen me throughout the day but not once did she even give me the courtesy of telling me she was going to perform my number. The lighting man was an idiot as he did not switch on a single light as Jenna crawled out from her corpse position gingerly balancing the tealights. All we saw were the flickering of tealights and vague flashes of a leg here, an arm there. This idiocy lasted for about 20 seconds as the first introductory notes rang a leaden toll in my heart. My embarrassment knew no bounds. As I watched Jenna butcher my choreography because she had no clue how to dance with tealights and obviously could not replicate the movements of my choreography, my ire began to rise above my utter humiliation. Right there and then, I told my students if I ever caught any of them performing my Piya Rey in that fashion, I would hunt them down and kill them. I was so angry that I began to mock stab myself through the heart and the dancers in the room who knew me and knew that that was one of my signature pieces all laughed and gave me commiserating and pitying looks. 3A sniggered and gloated at first but when she realised how genuinely upset I was, she began to cast extremely scornful looks at Jenna. Let me just put this in perspective. Years ago I performed Piya Rey for a large corporate event and I kindly invited the organiser and Joey to be my “back-up” dancers for this number. Please note they were paid for this performance. While I dance upstage sans tealights, these two flanked me downstage with tealights. Because of their lack of Indian classical dance background, I choreographed some very simple poses for them which involved them moving the tealights around but barely dancing. 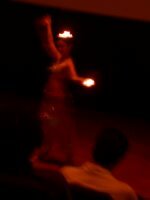 I have only performed this routine with tealights in front of a predominantly Indian audience and I have never taught this to anyone. The organiser and Joey, therefore, have never seen my Piya Rey with tealights number and only harbour dusty memories of my phenomenally stripped-down tealight routine for them. As such, it was obvious, they ripped off the poses I taught them when they were my back-up shadow dancers, ripped off the choreography I taught their students at the workshop, tore it apart, ruined it and spat it out like regurgitated mush for Jenna to despoil at this competition. How this can even be given an originality & creativity score is beyond me. Perhaps a score of the most original destruction of a ripped off choreography, yes. To say I am furious is an understatement. We had known of the organiser and her gang’s duplicity and frequent piracy but the blatant audacity to do this in the faces of the ones they are ripping off is beyond the pale. I am beyond disgusted. I have not felt so violated since I went to see my gynae. Sorry Dr Rauff. Perhaps it is a blessing in disguise. Because Jenna did such a bad job of performing Piya Rey and the organiser and her minions did such a disastrous job of pirating my choreography, the audience was extremely cold towards Jenna's inflammatory insult. Objectively, Jenna did not dance. 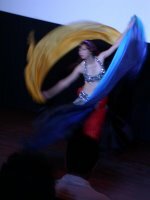 She barely moved her hips in nebulously faint hip accents, she hardly moved from the spot, her movements were as Indian as Bill Gates and her middle eastern dance techniques were nowhere in sight. All Jenna did was balance the tealights and shuffle. She was essentially just a human tealight holder. I was paradoxically relieved and angered. Relieved that no one thought I had anything to do with that travesty of a dance and infuriated that they had dared to blatantly rip me off while I was sitting there in the audience. The good thing that came out of this was that my students now truly appreciated my choreography, teaching and style. As one of them disclosed, she had not really enjoyed this number before as she could not understand it but after seeing Jenna’s farce of a dance, she began to really appreciate my dance. Now that I have ranted, I will rate this sham. Jenna got a 4/10 for presentation & framing; a 1/10 for fluidity of technique; 3/10 for expression; 0/10 for originality & creativity (although if I could give minus points I would); and 0/10 for rhythm & musicality. I think have been very fair as giving points, instead of a slap to face as vicious as the one they have given me, is incredibly generous of me I think. So, overall, this criminal thievery received 1.6/10. The beauteous Jamila came next in her beautiful peach and blue bedleh which she later revealed to be her personal customisation from two different costumes. I commend her on her taste as she looked fabulous in it. But then again, she is so gorgeous that I think almost anything would look good on her. 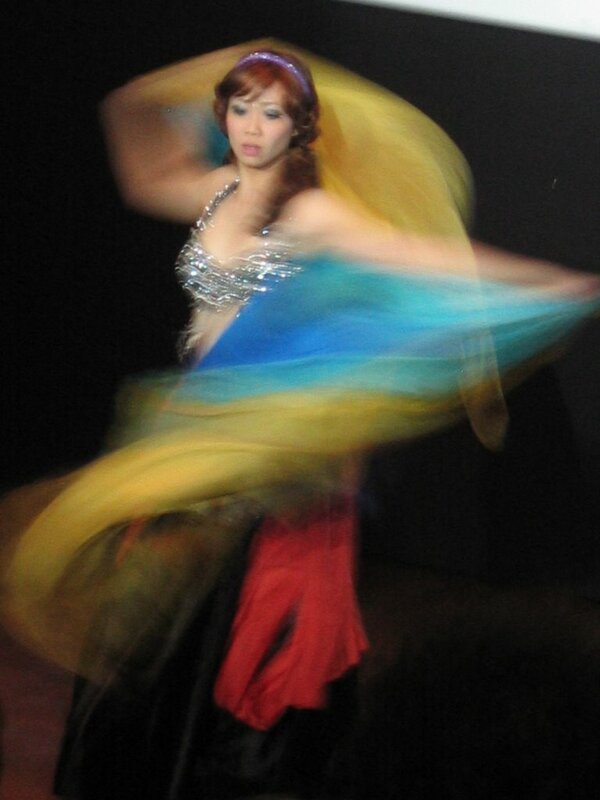 This mainland Chinese dancer (at a later interview, Jamila informed me she is a Singapore citizen) glided through her Ayesh Beek number with vividly hued double veils. While there was much traveling and veils manipulation, her veil technique was not as strong as Sha Sha’s. However, she exhibited more middle eastern techniques and I rather thought this evened things out between these two rather similar dancers. Again, she pulled out the popular (at least with her school) pharoanic arms which I thought was a little out of place with the music and she, too, displayed the unfortunate chicken shoulder shimmies and arms that so plagued Nyssa. Her fingers were weak, her travelling was marred by the same affliction blighting all her schoolmates - legs which were spread too widely. She really fumbled when she had to perform a Sohair accented traveling circles – her timing and rhythm just gave up the ghost and decided to take a holiday. Still, Jamila is so beautiful that even with less than stellar techniques, you would be mesmerised. Even if she was squatting on the ground and picking her nose, you would still happily watch her and conveniently miss the distasteful acts as you bask in her glory. I was not sure if her choreography was another lifted number as someone stated that it might be another Tamallyn Dallal number. In light of all the precursors of duplicity, I marked her down on originality & creativity. I was not inclined to be overly generous in this respect being one of the victims. I gave her a 7.5/10 for presentation & framing; 5/10 for fluidity of techniques; 5.5/10 for expression; 3.75/10 for originality & creativity; and 4.75/10 for rhythm and musicality, giving Jamila an overall score of 5.3/10. My favourite dancer’s return to the stage in a gorgeous blue one-piece costume was both a pleasure and slight concern. Rani was the only one who wore a one-piece during this competition and again, that pointed to her real individualism that sets her apart from the rest in both style, class, originality and league. However, since Alhambra is not known for their fusion, I worried that Rani might not perform as well as her outstanding Traditional piece. As before, the difference between the schools was apparent. 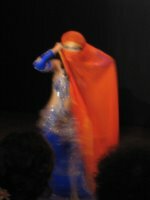 Whereas the organiser’s school would swirl, flick and float their veils for visual impact before discarding them to dance without prop, the Alhambra way was more creative. Sure, they did the requisite swirl, flick and floats but they also strategically released the veil, danced, and then seamlessly picked up the veil again for another segment of veil dance before discarding it finally. Rani’s veil control was solid even if not flashy, like Sha Sha's or Jamila's. This could be pegged to the prevailing traditional style so advocated by her school. Again, her technique was obviously superior as she executed her hip and shoulder accents to the beat and with consummate control. Her timing and sense of rhythm were spot on even if I was not as impressed by the interpretation of the song. But somewhere along the way, something went wrong. Listening to the music and seeing Rani turned her back to the audience for a prolonged period as she seemed to discreetly prod herself in the chest, 3A and I concluded that she was probably going to do a sagat segment within her performance. We were very excited as this would be the first and only sagat performance. Being a bit sagat-challenged myself, I was delighted as dancing to sagat will demonstrate another level of technical and musical superiority. However, after too many moments had passed, during which time this experienced dancer still danced gentle taksims to the counts, Rani turned back to the audience empty handed. 3A and I looked at each other and I declared, “Note to self: Never put sagats in bra top in case they get stuck. At least she can carry off a costume malfunction now,” as I simulated two sagats plastered to the headlights. 3A smacked me. Bully. Either Rani could not fish the sagats out in time or one of the elastic bands on the little cymbals had broken – something which happened to me once as the elastic on one side of the sagats broke, causing the golden disc to fly across the stage, almost taking out an audience member’s eye. Rani’s extended her lead with 7.5/10 for presentation & framing; 7/10 for fluidity of technique (minus point for the sagats stuck in bra incident); 7/10 for expression; 7/10 for originality & creativity; and 6.5/10 for rhythm & musicality. Her overall score was 7/10. Not as good as her traditional piece but still lovely. Poor Wei Ling, again in her unenviable position as the final dancer and right after Rani, was the last dancer from Alhambra. 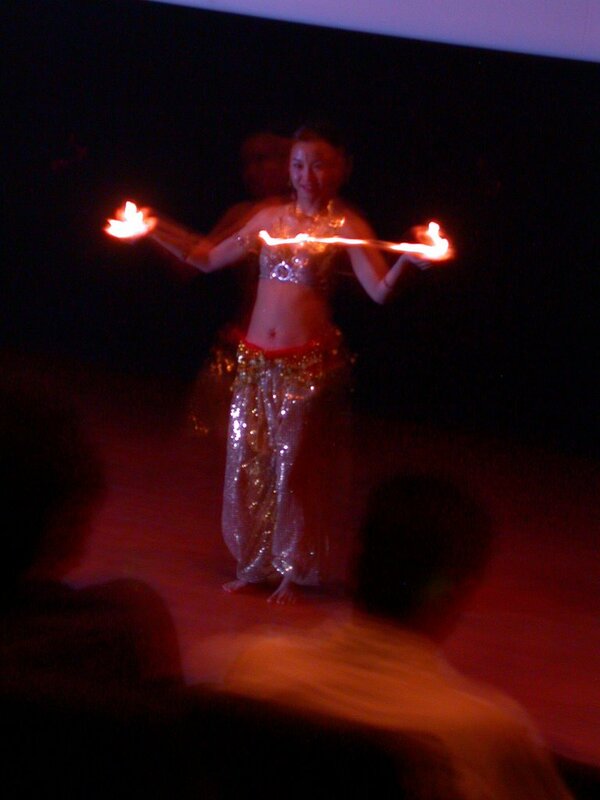 Also dancing to Enta Omri, but the original version, Wei Ling was stunning in a deep orange bedleh that made her look seductively burnished. Her stage presence was strong and her confidence high. Watching her was pleasant despite her raw technical skills. I was not a fan of her interpretation of this famous song as she rushed her movements such that there were hardly any pauses as combinations collided into each other. It made figuring out what she was doing difficult because the movements all seemed to meld together with no definition or delineation. Wei Ling’s sense of timing and rhythm also faltered and again, it was obvious she is quite a beginner. Still, I like her stage style and her unwavering smile and spirit. I gave Wei Ling a 6/10 for presentation & framing; 4/10 for fluidity of technique; 5.75/10 for expression; 5.5/10 for originality & creativity; and 4/10 for rhythm & musicality. Overall, she garnered 5.05/10 for her efforts. Hereby ends the Traditional & Fusion segments of the local solo competition for the Asia Global competition. We were dismissed for an hour as the judges deliberated. I will relay my observations, discoveries and an exposé in the next Part. I warn you now, what I shall post next will shock and horrify you. It will also turn the entire industry on its head. However, I cannot in all good conscience participate in the deliberate fraud of our industry even if it casts a very bad light on all of us.